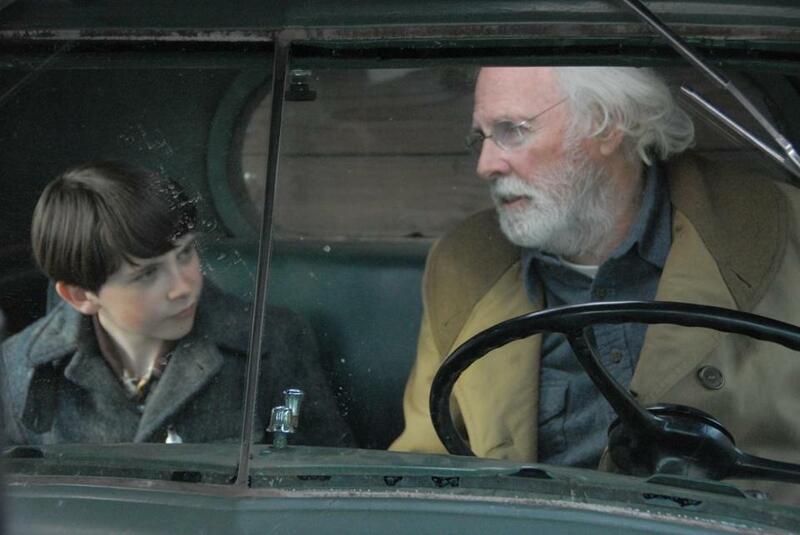 “Northern Borders’’ stars Bruce Dern (right) and Brad Heck. New England is well represented, on the screen and behind the camera, in the 22d annual Woods Hole Film Festival. Running this Saturday through Aug. 3, the oldest film festival on Cape Cod, which has long championed regional works, again offers an impressive slate of narrative features, documentaries, and shorts from both established and emerging filmmakers. Sherborn native Andrew Mudge’s feature debut, “The Forgotten Kingdom” (Aug. 1), is both intimate and epic. Shot on location in Lesotho, a developing nation surrounded by South Africa, it’s about a young man, Atang (Zenzo Ngqobe), who leaves bustling Johannesburg to return to his ancestral land in order to bury his estranged father. In Lesotho, Atang meets Dineo (Nozipho Nkelemba), a teacher at odds with her traditional father as she cares for her dying sister in a region grappling with the ravages of AIDS. Boston native Greg Cahill also looks abroad for his feature debut, “Two Shadows” (next Sunday and Aug. 3), shot partly in Cambodia. Sophea Pel stars as a Cambodian-American hipster wannabe who returns to her birthplace to find out whether her two siblings who disappeared during the civil war 20 years earlier are still alive. Cahill’s film is one of the first to explore the contemporary Cambodian-American experience, particularly the search for missing family members in the wake of the Khmer Rouge genocide of 1975-79. Closer to home, Vermont filmmaker Jay Craven returns to the WHFF with “Northern Borders” (Aug. 2). Based on the Howard Frank Mosher novel, it returns two legends to the screen, as Bruce Dern and Geneviève Bujold play a quarreling couple whose 10-year-old grandson comes to stay at their Kingdom County farm. Craven made the low-budget film in collaboration with students from Marlboro College, where he’s a film professor, and young filmmaking professionals who worked in all levels of production. Another collaborative effort between aspiring and established filmmakers is Ernest Thompson’s “Heavenly Angle” (Aug. 1). The “On Golden Pond” Oscar-winning screenwriter and New Hampshire resident works with a regular community of writers, actors, and producers. “Heavenly Angle,” their latest effort, spoofs the culture’s love of all things Hollywood as well as small-town mores. Thompson plays a down-on-his-luck movie director who descends on a small New Hampshire community with promises of shooting a film there — if he can lure investors. Thompson will offer a master class on Aug. 2. The documentary “Married and Counting” with Stephen Mosher (left) and Pat Dwyer. Cape Cod native Isaak James shot his debut feature, “By Way of Home” (July 29), in Brewster, Chatham, and Provincetown. It features Eva James (the director’s sister) as a young woman forced to return during a bleak winter to work in her family’s Cape Cod restaurant. Among the many documentaries in this year’s festival are Harvard grad Allan Piper’s “Married and Counting” (July 30), about a New York couple, Stephen Mosher and Pat Dwyer, together 25 years, who embark on a cross-country trip to get married in each state where gay marriage is legal. Oscar-winning filmmaker Freida Mock (“Maya Lin: A Strong Vision”) has made “Anita” (Aug. 3), about Anita Hill and the two decades since she testified before the Senate Judiciary Committee about Supreme Court nominee Clarence Thomas. Shot partly at Brandeis University (by Boston filmmaker Bestor Cram), where Hill is professor of social policy, law, and women’s studies, “Anita” reflects on how attitudes toward sexual harassment have evolved since 1991. Cram previously worked with Mock on “Wrestling With Angels,” about Tony Kushner’s award-winning play “Angels in America” and which screened at Woods Hole in 2006. A former staff producer for WGBH, María Agui Carter made documentaries for “La Plaza.” Her feature documentary, “Rebel” (July 28, 7 p.m.), chronicles Loreta Velazquez, a Cuban woman who disguised herself as a man to serve as a soldier and spy during the Civil War. Critics dismissed her 1876 memoir as a hoax. “Rebel” explores the other secret women soldiers in the Civil War, as well as how history censors and denies inconvenient truths. The festival also boasts a diverse program of short films. Among local filmmakers represented are Cambridge resident Avery Rimer, whose “Halfway Somewhere Else” (Saturday) is about a middle-aged man’s marital infidelities. The short film was written by Debbie Danielpour, professor of film at Boston University. “The Commitment” (Aug. 1), from longtime Boston resident Albert M. Chan, is about an interracial gay couple adopting a newborn baby.